Big news!! We recently had the opportunity to participate in a Q&A with dog behavioral expert Cesar Millan- yes, THE DOG WHISPERER. While we are huge fans of his shows, we have been DYING to ask him about how to try and solve some of Paddington's occasional problems. With the second season of Cesar's Nat Geo WILD show Cesar 911 premiers on Friday, February 27th, we were thrilled that Cesar could take some time to share his advice with us. It's not something we often talk about on this blog, but Paddy is NOT a huge walker - we can be literally walking down the street and she'll stop in her tracks and refuse to move forward. We've tried bringing treats and all kinds of tricks, but once she stops... she's not going anywhere. Since we've also seen other small dogs do this while out, we asked Cesar for his advice as to what might be going on. Question: Our dog while walking on a leash will sometimes stop in the middle of the sidewalk for no reason at all. We've tried to figure out why this happens (more often than not we're alone - there aren't any other people/cars/animals around), and would love some tips for making walking a more enjoyable experience for our dog. The first thing to look at is your dog’s body language when she freezes. Is she focused intently on something and alert? Then she has probably noticed something that you can’t see or hear — remember, a dog’s main sense organ is its nose, and they can detect dogs, people, or other animals that are too far away for you to see. If this is why she is freezing, then you should be able to easily redirect her attention and get her moving again. However, if when she freezes she shows signs of fear, like hunched posture, tail between the legs, and shaking, then she has made some association with something in the area and a bad experience. It’s important when a dog freezes in fear to not try to force them to move forward but also to not try to comfort them with affection. Before you can rehabilitate the behavior, though, you will need to figure out what it is in the environment that is making her do this. Has she ever had a traumatic experience on the walk, for example? Finally, if Paddy is showing neither alertness nor fear but still stops on the walk, have your vet check her out to see whether there are any physical issues causing the behavior. Our second question actually was inspired by the fact we often tune into Cesar's show on Nat Geo WILD. While it's great that Paddy has amazing vision, she often will start barking when she spies another dog or animal on TV. Thus, we asked Cesar for some tips on how to discourage her from doing this and allow us to watch Cesar 911 in peace. Question: Our dog will occasionally bark at the television. How do we get her to stop? Immediate correction when the behavior happens, and consistency in providing it. If your dog is showing an unwanted behavior, you have to give the correction every time, and you have to do it as soon as the dog starts the behavior. You also need to be aware of how the behavior developed. A lot of times, a dog will do something like bark at a cat on TV and, the first few times, the humans find it funny, so they’ll laugh and talk to the dog. Unfortunately, when you do this, you’re telling the dog, “Keep doing that,” until it becomes an annoying misbehavior. That’s why, when you start working to eliminate the behavior, you have to be consistent and patient, because now you’re trying to teach the dog to not do something that you originally taught it unintentionally. Hopefully you found this advice as helpful as well. A huge, special thank you to Cesar for sharing his insight and tips! 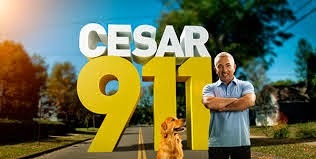 For even more great pieces of advice and amazing stories make sure to tune into Cesar 911 on Fridays at 9/8 Central. Nat Geo is also running a 2-hour special that was filed at the Palms Casino Resort as part of Cesar's world tour - Cesar Millan Viva Las Vegas!, which will be airing on Friday, February 20th at 9/8 Central.